Medium: Acrylic on plywood. Designed and created by the Haggerty Museum of Art Student Advisory Committee. In 1983, internationally renowned artist Keith Haring came to Marquette University to paint a mural for the construction site and future home of the Haggerty Museum of Art. The 100-foot-long fence features Haring's trademark imagery (i.e., radiant baby and barking dog) painted in florescent orange with thick black outlines. Haring painted the outlines and invited the community to fill-in the interior spaces. 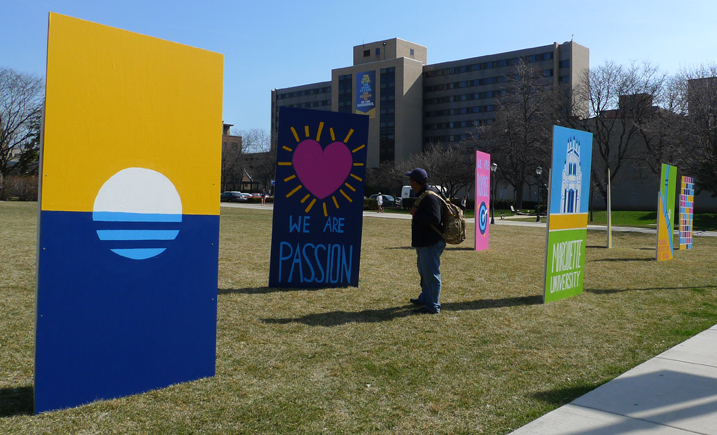 In that same spirit of community and collaboration, students from Marquette and MIAD worked together to create a new kind of mural for the grounds of Marquette’s Alumni Memorial Union. The project was organized by the Haggerty Museum of Art Student Advisory Committee (SAC), a volunteer organization comprised of Marquette and MIAD students who plan programs and weigh-in on museum activities. According to SAC member Brian Pfister, “By deconstructing We are Passion, We are Purpose into single panels, we have symbolically rejected traditional mural painting and have instead created a temporary outdoor gallery that can be viewed as one installation or experienced as individual pieces. The idea was to make a space for everyone; a space for curious minds, leisurely strolls, and critical discussion." 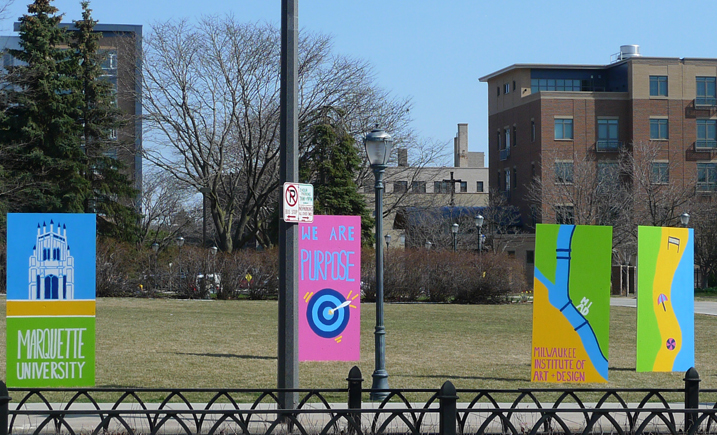 The piece speaks to the unique qualities of Milwaukee and the bringing together of different voices. We are Passion, We are Purpose will be on view from April 30 through May 13, 2018 and then reinstalled at the end of May.